With more versatility than the new Elantra sedan, the GT is here to take on the Golf and Civic. 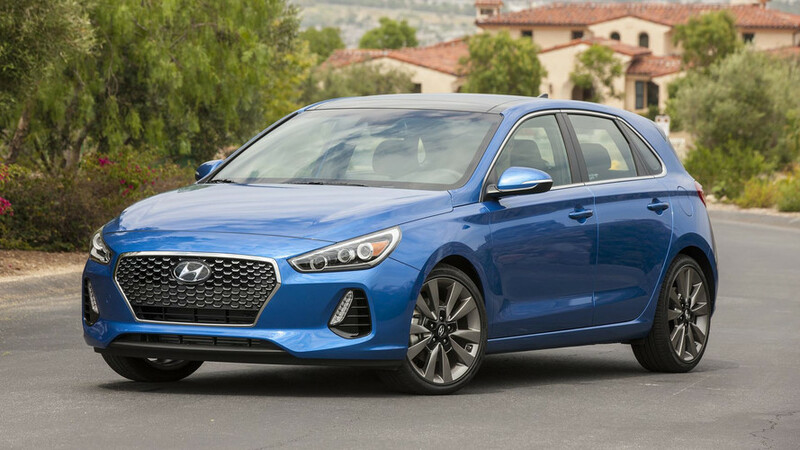 Hyundai is expanding the appeal and versatility of its Elantra with the introduction of the 2018 Elantra GT. As before, those last two letters signify that it’s a hatchback derivative – in this case, based on the Hyundai i30 that was already revealed overseas. It debuts at the Chicago Auto Show and goes on sale this summer. Visually, the Elantra GT looks very similar to the existing i30 and Elantra sedan, with what Hyundai calls “European flair.” Notable styling cues include a sharp crease that runs from the front fender to the taillights, and an unusual convex-concave profile for the rear end. 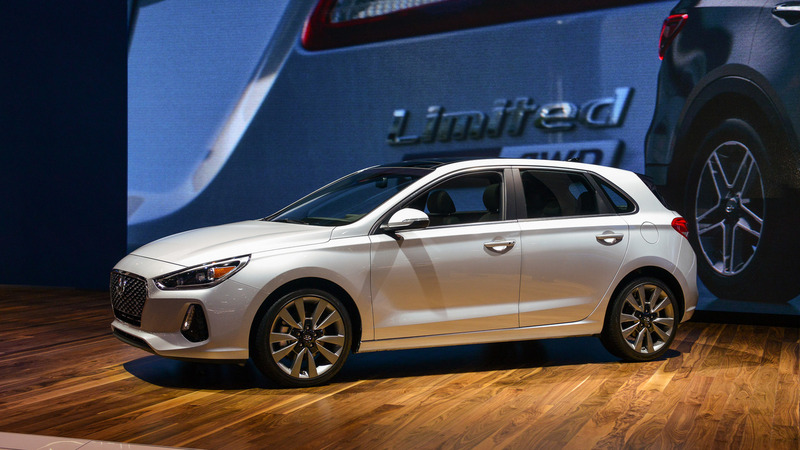 Thanks to extensive use of high-strength steels, Hyundai says the Elantra GT’s body-in-white is 61 pounds lighter than before, yet 22 percent stiffer. 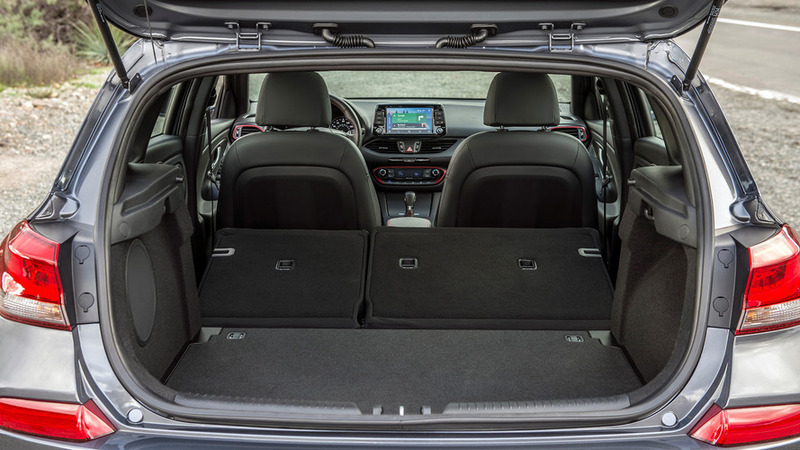 That new hatchback body provides a hugely spacious cargo area, with 24.9 cubic feet of storage or 55.1 cubic feet with the back seats lowered. That’s far more than in an Elantra sedan (14.4 cubic feet), and also more than the Elantra GT’s competitors. 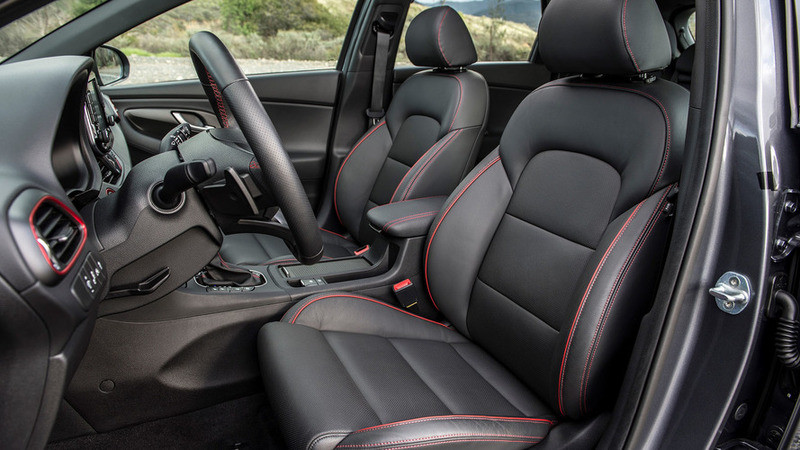 With the seats up, it’s got more space than a Volkswagen Golf, Mazda3, or Chevy Cruze hatchback; with them down, it even has more storage than the roomy Honda Civic Hatchback. Base Elantra GT models use a 2.0-liter inline-four engine good for 162 horsepower and 150 pound-feet of torque, mated to manual or automatic transmissions with six forward speeds. That’s beefier than the Elantra sedan’s 2.0-liter, which generates only 147 hp. The Elantra GT Sport, like its sedan cousin, has a 1.6-liter turbo engine good for 201 hp and 195 lb-ft. It has a seven-speed dual-clutch available alongside the six-speed manual. And the GT Sport also has wider 18-inch wheels versus the standard 17s, larger brake discs, and independent rear suspension instead of the base model’s torsion beam. Hyundai says it tested the Elantra GT at the Nürburgring to improve its sportiness without affecting handling. We’ll have to get behind the wheel to see how well that objective was met. The inside of the Elantra GT is familiar, too, with nice appointments and a logical control layout. One big departure from the sedan is the new 8.0-inch touchscreen infotainment system, which comes standard. It perches atop the dash in a parallelogram-shaped, tablet-like stand. It offers navigation, Apple CarPlay, Android Auto, and more. Other features include optional LED headlights, dual-zone climate control, wireless phone charging, and Hyundai’s Blue Link telematics system. Active-safety options include pre-collision braking, adaptive cruise control, blind-spot warning, and lane-keep assist. While we don’t yet know how much the 2018 Hyundai Elantra GT will cost or what fuel-economy figures it will return, the new hatch looks to be a competitive entry into the compact-hatchback class. Hyundai Motor America debuts the all-new 2018 Elantra GT at the 2017 Chicago Auto Show. Lower, wider, and longer, the all-new Elantra GT adds a more aggressive stance and interior volume to its clean European style and driving dynamics. When the new hatchback arrives this summer, shoppers can choose between two models, the efficient, smooth running GT, or the more powerful and fun-to-drive GT Sport. Elantra GT is based on the new-generation i30 model designed for the European market. With clean proportions, flowing character lines, and an attention grabbing new cascading grille design, the new GT imbues class and sophistication. It’s posture; lower, wider, and longer; shows the GT means business. The GT lands where European style meets American can-do attitude and ability. And it’s not merely skin deep, over half the structure (53-percent) comprises of advanced high-strength steel, nearly double the outgoing generation. And it’s bonded together with just over 367 feet of structural adhesive. This combines to make the Elantra GT, stiffer, stronger, and lighter. It’s 22-percent more rigid than the last GT to be specific. And the body-in-white weighs 61 pounds less. That combines with a slippery 0.30 coefficient of drag making the GT feel solid, efficient and smooth. While the outside dimensions effectively match that of most compact hatchbacks, clever ergonomics and packaging make room inside for five and so much more. In fact, with 96.5 cubic feet of passenger volume and nearly 25 cubic feet of cargo volume, we expect the EPA to classify the Elantra GT as a large car, rarified territory for this class. And with the rear seats folded, the GT offers massive amounts of space for cargo. For 2018, choose between two inline-four-cylinder engines in the Elantra GT. The efficient yet robust, direct injection 2.0-liter makes an estimated 162 peak horsepower. It mates to either a six-speed manual or automatic transmission. Opt for the GT Sport and get the 1.6-liter turbo engine found in the Elantra Sport and enjoy an estimated 201 peak horsepower along with a broad band torque peak of 195 pound feet. The six-speed manual is available here too, or an athletic, seven-speed dual-clutch gear box. Taking advantage of the stiff and strong new structure, Hyundai tested and developed the Elantra GT on the Nürburgring Nordschleife in Germany. Running hundreds of laps, the engineers tested for ride, handling, and durability. This resulted in a suspension tune that feels taut yet comfortable, minimizing unwanted body roll yet maximizing wheel impact absorption. Opt for the GT Sport and the rear torsion beam suspension is switched for a fully-independent multilink setup, standard 18” alloy wheels and larger front and rear brake rotors for even more fun when the going gets twisty. All-in-all, whether it’s a spirited drive through a canyon road, or carrying your mountain bike to the trailhead up the canyon, the Elantra GT is ready. Aside from great available appointments inside the Elantra GT, like leather seats, alloy pedals, and dual-zone climate control, Hyundai added several new items to keep you comfortable and safe. The Elantra GT is available with conveniences like Infinity Premium Audio with Clari-Fi™, Apple CarPlay™, Android Auto™, and wireless smartphone charging. That’s on top of great standard features such as 8-inch display audio and 17-inch alloy wheels. For safety, the GT is available with several systems usually found in expensive luxury vehicles, such as Smart Cruise Control with stop/start capability, Automatic Emergency Braking with Pedestrian Detection, Lane Keep Assist, Attention Assist, High-Beam Assist, and Blind Spot Detection with Rear Cross-traffic Alert. Vastly improved structure, Nürburgring refined driving-dynamics, and top-notch features in the new Elantra GT redefine what it means to be a “compact” hatchback. Hyundai Blue Link customers have performed more than 25 million remote starts since its debut in 2011. Although remote start is a great feature for hot weather, most take place in cold climates during January, February and March. In fact, Blue Link Remote Start with Climate Control is three times more popular in the winter. With this in mind, Hyundai engineers have enhanced the Remote Start with Climate Control feature to include control of the rear defroster and heated side mirrors into the Blue Link mobile app. These new enhancements debut with the launch of the 2018 Elantra GT and will be available on other models in the future. For the ultimate level of convenience when it comes to remote starting a car on a bitterly cold winter morning, Hyundai has its new Blue Link skill for Amazon Alexa. The skill works by a customer simply asking an Alexa-enabled device, like an Amazon Echo or Dot, to start their car. The interaction actually sounds like this “Alexa, tell Blue Link to start my car at 80 degrees.” To send commands to Hyundai vehicles via Alexa, users must enable the Blue Link skill in their Alexa app available on: iOS, Android and Fire devices; and then link their existing Blue Link account within the Alexa app. Voice commands will only be sent to Hyundai vehicles after Alexa prompts owners for their Blue Link Personal Identification Number (PIN). The 2018 Elantra GT also debuts Hyundai next generation AVN 5.0 infotainment system. This system features an upgraded processor for greater responsiveness, as well as an eight-inch screen vs. the seven-inch screen in last generation Elantra GT. Using presets with AVN 5.0 is a snap because AM, FM and SiriusXM channels are now combined on one screen. A bird’s eye view has also been added to Navigation maps and drivers can now get traffic flow and incident data without ever paying for a subscription via HD Radio.